Winner of the 1997 Advanced Technology Award, Cellfood is the cell-oxygenating formula that makes Cellfood Oxygen Gel the most nourishing, revitalizing skin care product available. It contains 78 ionic trace minerals, 34 enzymes, 17 amino acids, electrolytes and dissolved oxygen. But what makes Cellfood especially unique is its ability to 'dissociate' water molecules— weakeningtheir bonds and releasing vital oxygen and hydrogen. This ability to release cascades of these precious building blocks of life has made Cellfood one of America's fastest-growing nutritional products today. Cellfood Oxygen Gel contains Cellfood proprietary blend, aloe vera, chamomile, glycerine, polysaccaride gum, and less than 1/5th of 1% methyl paraben. Cellfood Oxygen Gel is not tested on animals, and is fragrance-free and hypo-allergenic. Evening: Cleanse face well. Lightly glide your fingers over the gel and apply a small amount over face and neck, concentrating under the eye area. Your skin firms as the Gel dries. Oxygen Gel’s nutrients feed the skin all night, while restoringideal moisture balance. Morning: Wash off Gel; your face will feel clean and fresh. Then re-apply a light film. Skin firms as the Gel dries. Nutrients feed and protect the skin all day. Also use on any non-facial areas requiring revitalization. Quick-Mask: Apply a light film at any hour of day or night. Leave on for one hour. Wash off. Face will feel revitalized and nourished. Moisturizer and makeup tips: If more moisturizing is desired, either mix gel with your favorite moisturizer when applying, or apply gel first, and then moisturizer. You may also apply makeup or sunscreen over Gel. For persistent conditions: You may add 1 or 2 drops of original Cellfood concentrate to the Oxygen Gel for special skin problems. Don't add it to the jar— rather, mix a drop or two into an individual applicationof Gel. You may use cap for mixing. Gel will become more liquified, and will penetrate your skin's cellular tissue with enhanced oxygenating power. Detoxification: When first using, short-term skin breakout may occur as toxins draw to the surface. This is a normal healing process. Note: A generous layer of Gel is desirable for healing skin problems, and may result in some minor flaking as the mask dries. For cosmetic use, using a thinner layer will prevent this. "I fell asleep under a sunlamp for six hours 26 years ago, which caused an area of puffy skin, resulting in a distorted, uneven smile. I've had this condition since. After one week of using Oxygen Gel morning and evening I noticed that my smile was even, and that the puffy skin around my mouth now looked firm, and both sides of my face were the same. I also now have tight, smooth skin under my eyes like I had at age 20-something (I'm 50 now). I have my young face back! Internally, Cellfood has cut downmy need for sleep to 5 hours instead of 8, and keeps me active while working 16 hours per day, 7 days a week." "I recently began using Cellfood Oxygen Gel, and am very impressed. I never had skin blemishes until my mid 30's and have had no real success with products off the shelf or from the doctor. A friend of mine was using your skin care product and I noticed her face cleared right up. I inquired as to what she was using and the fact that her complexion was radiant— and then bought some for myself, and got the same results! Even my teenage boys used it and their faces cleared up— it was wonderful! Thank you!" "I use the Oxygen Gel on my skin to try to offset some residual effects of surgery— and the incision line is reducing in size, and has become a lot smoother. I've also used it on my crow's feet and they've almost disappeared in a little less than 3 months." "I've lived with facial blemishes for my entire adult life— and have lived with a certain degree of embarassment as a way of life. I've spent thousands of dollars for treatments that seemed promising, but had no lasting effect. Your Cellfood Oxygen Gel has given me clear skin for the first time since I was 12, and I can't describe my gratitude to you. My husband looked at me yesterday and said that my face was 'truly beautiful.' Need I say more?" "My dog had an open wound that wouldn't heal for over a month. I put some Oxygen Gel on it, and watched it literally heal up in less than 3 days. Thank you!" "Several weeks ago, I was getting ready to retire for the night and switched off the light in my bedroom. Right after doing so, I proceeded to bang my foot into a rocking chair that was located near my bed. The pain was excruciating; so I ran into the bathroom and beheld a horrible wound on my foot that was all swollen and very discolored. Straightaway, I applied some Cellfood Oxygen Gel on my foot and, within seconds, the discomfort was completely gone! I went to bed and, when I awoke and looked at my foot the following morning, there was absolutely no sign of any injury whatsoever! It was completely gone!" 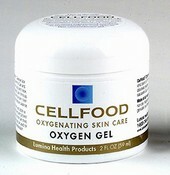 Cellfood Oxygen Gel comes in a 2 ounce jar which will last up to several months, depending upon use. These statements have not been evaluated by the FDA. This product is not intended to diagnose, treat, cure or prevent any disease. If under medical care, or if pregnant or nursing, consult a health professional.